A local resident of Rivervale for the past 20 years, Steven has a keen interest and strong involvements with local community groups and sporting clubs. Enjoying a genuine passion for people and life, Steven places a high priority on spending quality time with his wife and four children and living a healthy lifestyle. Steven is an active member of the community, through volunteer groups such as Red Cross Blood Bank, Salvo Soup Kitchen and the Belmont Community Growers Association, as well as a passionate team member in a local Soccer team. With over 25 years experience in the Real Estate Industry through his involvement in several Agencies, Steven is a Licensed Agent as well as a recipient of many Real Estate Industry Awards. Always looking to improve his skills in the real estate industry, Steven has achieved his Training Certificate at REIWA to become a leading trainer of Sales Representatives and Agents. With a genuine passion for people and property, Steven has an amazing ability to assist clients in exceeding their real estate goals with ease. His friendly, always positive and helpful nature, combined with the type of knowledge that can only be developed through many years of experience is rare in this industry. Steven chose to join the great team at Bourkes, as the culture is one of excellent customer service through training, self-improvement and professional development, which ultimately benefits the client. Backed by the strong support and outstanding reputation of the Bourkes team, he will ensure that you are provided with valuable and practical advice in handling the marketing, sale and settlement of one of your most valuable assets. 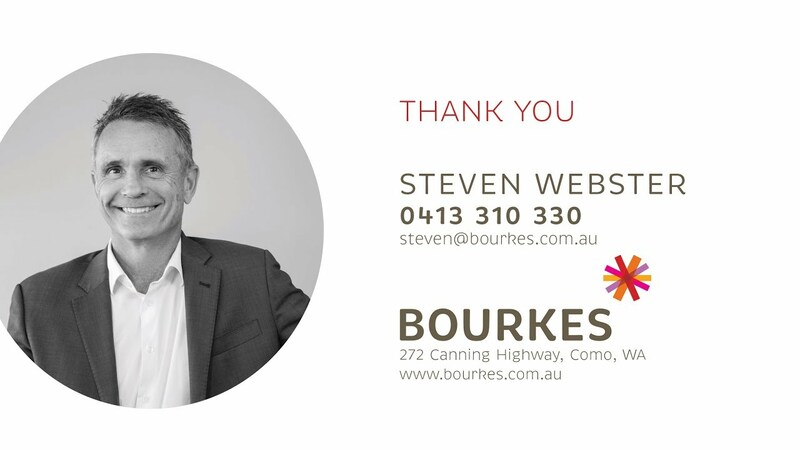 So whether it’s buying or selling an investment property or the family home, you can trust Steven to handle all your real estate requirements.